A calendar of events in April can be downloaded here. The Bulletin can be downloaded here. Our plans to convert Craft Cottage into three additional extra care flats were approved last year by LDNPA. We are finalising arrangements with our funding partners for this project and have a builder ready to start. We hope that work will begin shortly. Congratulltions to Janet Garlick and all our staff. Our premises were inspected on 22 January 2019 and we are delighted to report that they were awarded the maximum '5' rating. Further details are available here (Food Standards Agency website - opens in new tab/window). We are delighted to annouce the appointment of our new Scheme Manager, Joanne Busuttil, who took the post in mid-October. We are are pleased to welcome Siobhan to our staff team. Our Garden was opened to the public on Saturday 12th May from 2:00pm until 4:30pm. This event is held in conjuction with St Mary's Hospice and raised £700. Thanks to everyone who prepared this event and who helped on the day. Throughout October, Gatesbield held several events showcasing talent from within Gatesbield and beyond. For further details, our Festival programme is still available here. In November, we also had a Craft Demonstration - Sue Tyldesley demonstrating Encaustic Art (making pictures with wax). Gatesbield has submitted plans for the conversion of Craft Cottage into three additional apartments to extra care standards. For more information and if you would like to support the project, please download our leaflet here. More new residents at Gatesbield! 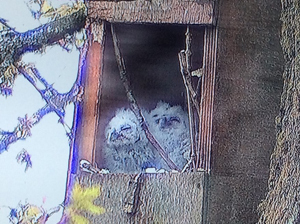 Two new young residents have made Gatesbield their home. We hope they will enjoy their time with us. 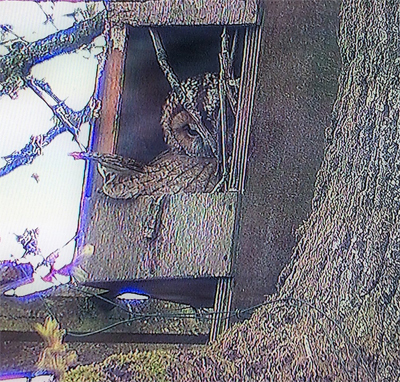 For the first time in several years, we have been pleased to see a tawny owl take up residence in our owl box. She is now raising her family of owlets. A CCTV camera has been set up to allow tenants and visitors to watch the comings and goings on the TV in the common room. Thanks to everyone who contributed to the collection for the camera system. We also have cameras set up in two bird boxes and on our bird feeders. Unfortunately, no birds have nested in the bird boxes this year, but we have seen a wide variety of birds using the feeders. We are delighted that Helen Thompson has joined the Gatesbield team to provide a new Tenant Support service available to tenants needing help with tasks around your home. Helen is here on a Monday and Tuesday, and is able to provide support with regular or occasional tasks such as light housework, laundry, paperwork, sorting cupboards, outings, shopping etc. Tenants can arrange a visit from Helen through the office. The service costs £13 for one hour, £7 for half an hour or £6 for laundry only. We are now able to offer tenants and their visitors a full lunchtime meal service every week day. Our cook, Janet Garlick, will work every weekday from 10th October. Nick Harrison will also provide cover as a Relief Cook. Our provider of out of hours cover notified us that they could no longer provide the service due to difficulties in recruiting suitable staff in the area. To maintain the cover currently provided, the Gatesbield Board agreed to recruitment additional staff to the Gatesbield team. Tenants should see no change in the service, but in the event of a problem between 5pm and 9am requiring someone to attend a tenant's flat, this will now be provided by one of the Gatesbield 'on-call' team. All members of the 'on-call' team live close to Gatesbield, and will normally be on-site within 30 minutes. Tenants access the service exactly as previously using a red cord or pendant alarm to call Astraline. Depending on the nature of the problem, Astraline will call a member of the 'on-call' team and/or the emergency services as appropriate. We welcome four new part-time and casual staff to the Gatesbield Team - Julie Eves, Nick Harrison, Shelly Stokes and Helen Thompson. All four will help provide cover as Relief Wardens when neither Andree nor Fiona are on duty. Julie, Nick and Helen will also provide out of hours on-call cover.. Helen is also our Tenant Support Worker, providing additional domestic help to tenants on a chargeable basis. Nick is also our Cleaner and available to stand in as a Relief Cook. Helen Clark has left Gatesbield as she and her family return to live in the south of England. We send her our very best wishes for the future. We congratulate Jess Gillam on her spectacular performance in the Grand Final of the BBC Young Musician Competition 2016, which took place on Sunday 15th May at the Barbican. Jess, who very kindly performed along with her younger sister Patsy at Gatesbield in 2014, was the first saxophonist ever to reach the final and clearly has a stellar future ahead of her. We were delighted to welcome Sylvia Frith (Gatesbield's first Scheme Manager) to our Quaker Meeting for Worship recently. 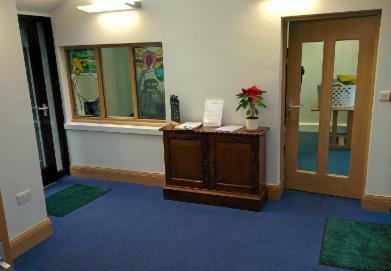 She very much admired the new facilities and was extremely pleased to see Gatesbield continuing to thrive. We hope to see you again soon, Sylvia! Are you involved at Gatesbield as a volunteer, Board member, part of the staff team, maybe are a friend or family member of one of our tenants, or even just interested in knowing more about us? Why not join the newly launched 'Friends of Gatesbield'? 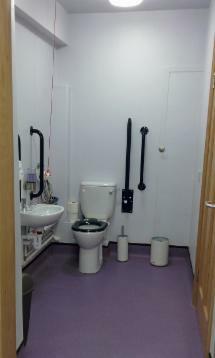 We are delighted to announce the completion of our 'Improving Access' project, which aims to extend and redevelop the communal facilities at Gatesbield, to enhance participation and enjoyment of our services.